What Should You Include In Your Emergency Car Kit? An emergency car kit is something every driver should have and hopefully never need. Covering everything from running out of gas to minor car accidents, a good emergency car kit will have everything you need to stay safe and visible until either roadside assistance or the authorities arrive to help you. Exactly what you have in your kit depends on where you spend most of your time driving. Here in Nevada, it’s always a good idea to have plenty of water and something to shade you from the sun, especially in the baking hot summer months. If you happen to live in Minnesota, you’d be well advised to keep warm clothing on hand in case you find yourself stranded. 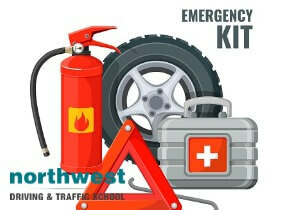 To help you build up your emergency car kit we’ve suggested a few essentials and some handy extras to get you started. If you find that you are stranded, out of gas, or have been involved in an accident, making yourself visible should be a priority. Road flares are a quick and easy method of making yourself extremely visible, aiding roadside recovery or the emergency services in finding you and warning other road users of an accident and potential debris on the road. Nearly every car owner has had to deal with a dead battery and they can occur for a variety of reasons, the temperature, battery age, faulty connections or even you leaving the headlights on while shopping. In these situations, it’s normally a good samaritan that comes to your aid, offering to jumpstart your car, however, without jump cables you are back to square one, so it’s always a good idea to have a set on hand. Regular check-ups of your car’s oil, radiator level and brake fluid should prevent you running into any issues on the road. However, if you do find your car is leaking vital fluids, then having extra brake fluid/oil/water to hand will allow you to get to the next service station without your engine seizing up. Modern cars rely heavily on electronics, so keeping extra fuses to hand is as advisable as extra brake fluid/oil/water. A blown fuse is normally indicative of a larger problem with your car’s electronics, so it’s a good idea to visit a mechanic if you find one has blown, but having spares on hand will normally allows you to get home without calling roadside assistance. Emergency repairs on a car can be hard on the hands, especially if it is a physical job like changing a tire. Keeping a solid pair of work gloves in your emergency car kit will reduce the chance of getting painful abrasions while conducting those repairs. A good first aid kit will have everything you need to react to a variety of situations, from mouth shields for CPR to tourniquets to stop bleeding. Most first aid kits designed for the home only and contain basics like bandages and antiseptic, so when you are picking one for you car it might be worth investing in a kit designed for use by trekkers and mountaineers to give you access to a larger variety of first aid equipment. Whether you are stranded or have been involved in an accident, staying hydrated and having access to sugar is vital while you wait for help. Bottled water and easy to store foods, like granola bars, are an excellent way of making sure you don’t add hunger or dehydration to your list of automotive problems. Nearly every form of automotive repair requires tools, so it’s a good idea to assess exactly what tools you will need to make basic repairs to your car and make sure you have them stored with your emergency car kit at all times. The items above make a great start to you emergency car kit, but they are only the start. When you are building your own emergency car kit it is important that you tailor it to your unique driving experience. Below are a few additional extras that can be added to your kit to personalize it to your normal driving environment. Northwest Driving School and Traffic School provides the Las Vegas community with live driving and traffic classes taught by seasoned instructors. All of our driving instructors have passed background checks, each automobile is DMV safety-approved and every member of the Northwest family is committed to providing excellent drivers ed and behind the wheel instruction.